Jean Béraud (1849–1935), The Absinthe Drinkers (1908), oil on panel, 45.7 × 36.8 cm , Private collection. Wikimedia Commons. 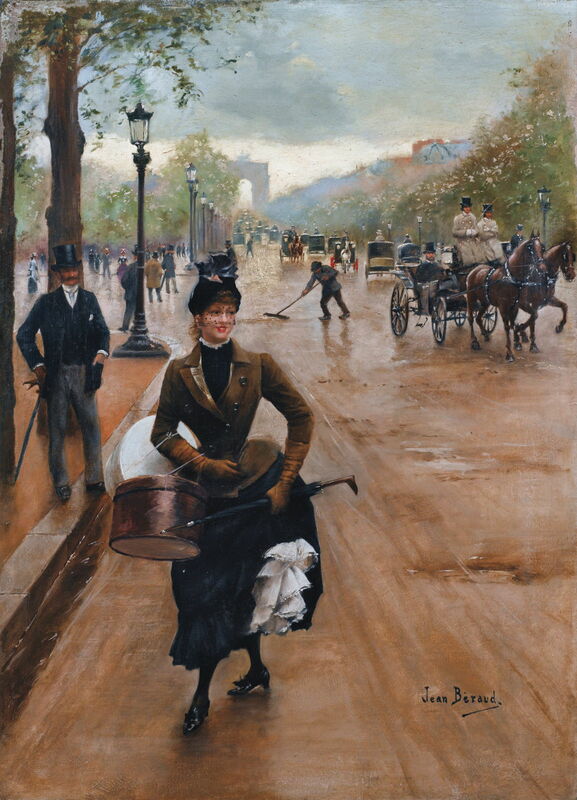 Jean Béraud (1849-1935) was not an Impressionist, but then neither was he not impressionist. Like Jules Bastien-Lepage, he used some features of Impressionist style, but remained outside the movement as such. He was born, the son of a sculptor, in Saint Petersburg, and started his training as a lawyer just before the Franco-Prussian War broke out in 1870. Following that, he switched to painting, becoming a pupil of Léon Bonnat in 1872. 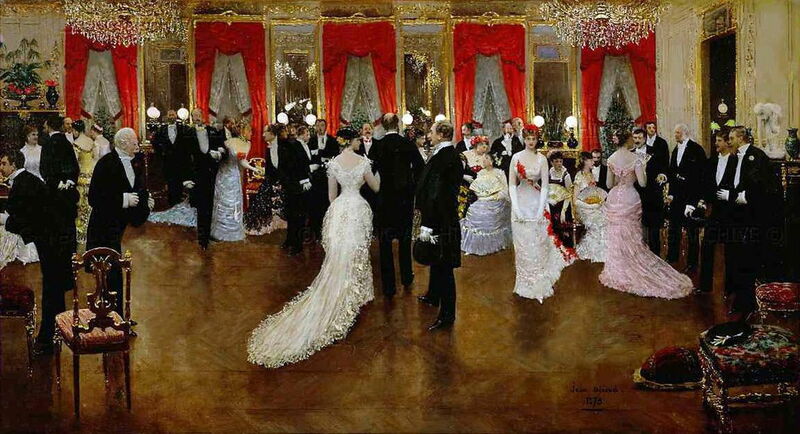 Jean Béraud (1849–1935), Le Bal Mabille (before 1882), oil on panel, 14.3 × 23.5 cm, Private collection. Wikimedia Commons. Le Bal Mabille (before 1882) may have been one of his earliest paintings. 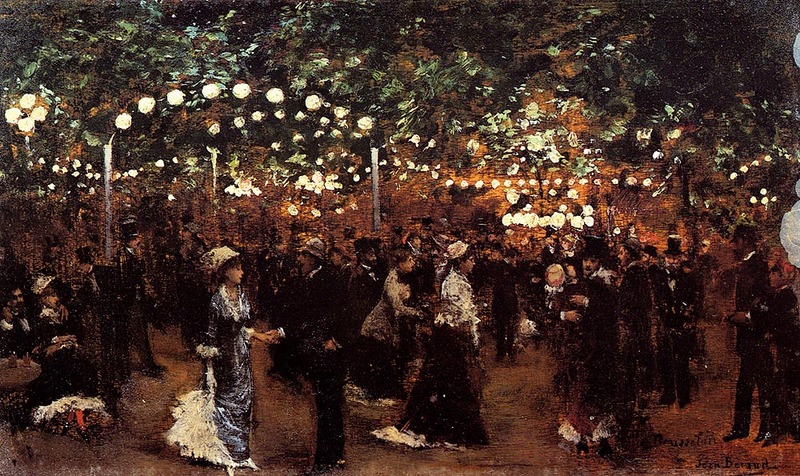 The Bal was a very popular open-air dance hall which took place on a location which would be in Avenue Montaigne in Paris. Started in 1831, it operated until 1875, and was demolished in 1882. It is claimed that the polka and can-can were introduced there, and it was struck by shells during the Franco-Prussian War. It is likely that Béraud painted this before the Bal closed in 1875. He did so in gloriously loose and gestural style, and at a time when you would be justified in labelling it Impressionist. Jean Béraud (1849–1935), Leaving Montmartre Cemetery (1876), oil on canvas, 66 × 53.3 cm, Private collection. Wikimedia Commons. 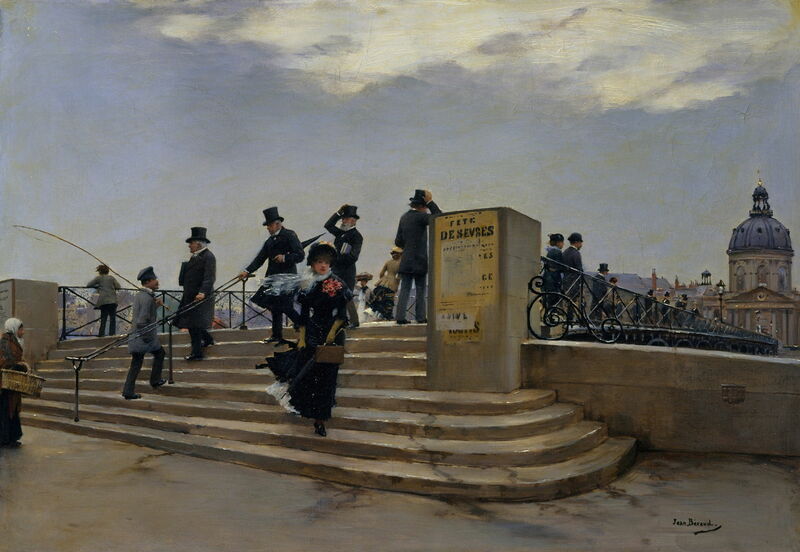 His first painting to be shown in the Paris Salon was accepted in 1872, but it wasn’t until 1876 that he achieved recognition there, with his Leaving Montmartre Cemetery (1876). Much more Salon-finished, it has the same greys and blacks as Caillebotte’s Paris Street, Rainy Day (1877), but lacks his photographic view. Jean Béraud (1849–1935), Soirée in the Hotel Caillebotte (c 1878), other details not known. The Athenaeum. The connection with Gustave Caillebotte continues in Béraud’s Soirée in the Hotel Caillebotte (1878), which shows a society event held in Gustave’s brother’s hotel in Paris. Over the following years, Béraud showed Paris highlife, and lowlife, its genteel indoor social graces, and its densely-packed outdoor spaces. Much of his painting took place in a carriage which he had converted into a mobile studio. Jean Béraud (1849–1935), Un Figaro de Rève (or The Newspaper Figaro and Figure) (c 1880), oil on canvas, 64.8 x 54.6 cm, Private collection. The Athenaeum. He also got out into the countryside on occasion, where he painted his brilliant Un Figaro de Rève (or The Newspaper Figaro and Figure) (c 1880) – back in Impressionist style again. Jean Béraud (1849–1935), A Windy Day on the Pont des Arts (1880-1), oil on canvas, 39.7 × 56.5 cm, The Metropolitan Museum of Art, New York, NY. Wikimedia Commons. But it is for his street scenes of Paris in the Belle Époque that he is now best known – paintings such as A Windy Day on the Pont des Arts (1880-1) and its fascinating details, such as the man carrying his fishing rod among the stream of top-hatted gentlemen. Jean Béraud (1849–1935), The Milliner on the Champs Elysées (year not known), oil on canvas, 45.1 × 34.9 cm, Private collection. Wikimedia Commons. Around this fashionably-dressed Milliner on the Champs Elysées (year not known), he carefully balances painterly background foliage and sky, and the careful detail of distant carriages. 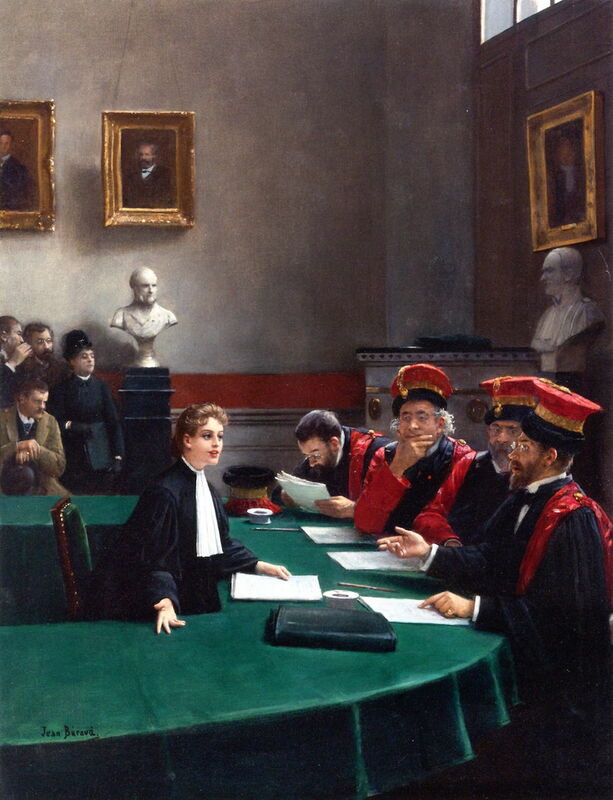 Jean Béraud (1849–1935), The Thesis of Madeleine Brès (or The Doctoral Jury) (date not known), oil on canvas, 63.5 x 48.3 cm, Private collection. The Athenaeum. His paintings also document the changes taking place in Paris life, and often give great insight into the evolving roles of women. In The Thesis of Madeleine Brès (or The Doctoral Jury) (date not known) he shows us one of the early woman doctoral students, defending her thesis before the academic jury. This was a major landmark in the improvements in women’s rights. Jean Béraud (1849–1935), Parisian Street Scene (c 1885), oil on panel, 38.7 × 26.8 cm, The Metropolitan Museum of Art, New York, NY. Wikimedia Commons. 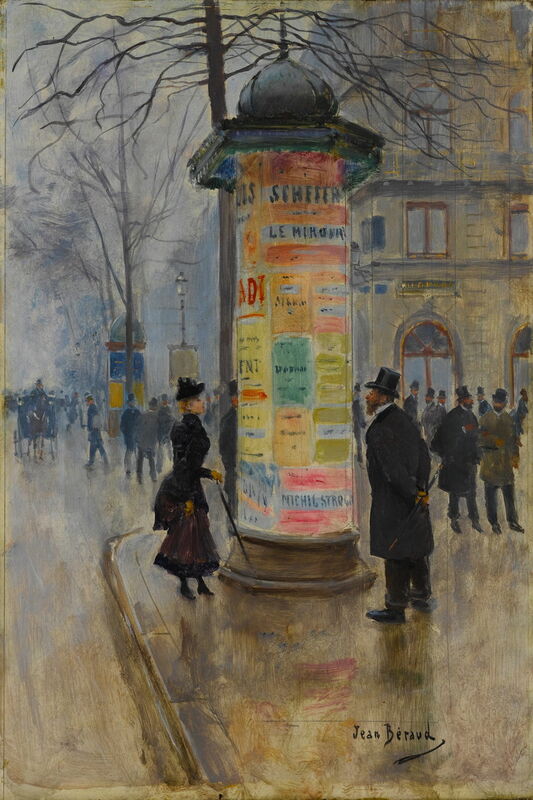 Working from his studio carriage, Béraud developed a particular affection for the street kiosks which had sprung up on so many corners, and were covered with posters. 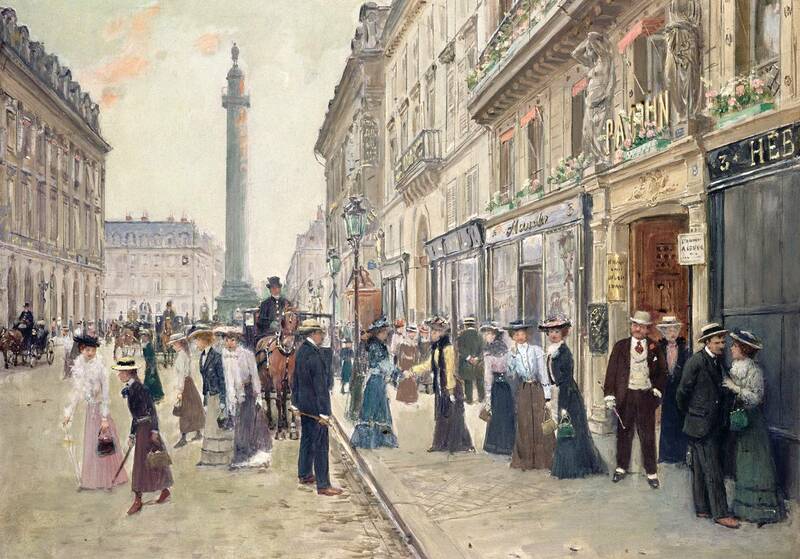 Parisian Street Scene (c 1885) is one example, on the Boulevard des Italiens from the corner of the Rue Laffitte. Jean Béraud (1849–1935) Carriages on the Boulevard des Italiens (1890), further details not known. The Athenaeum. 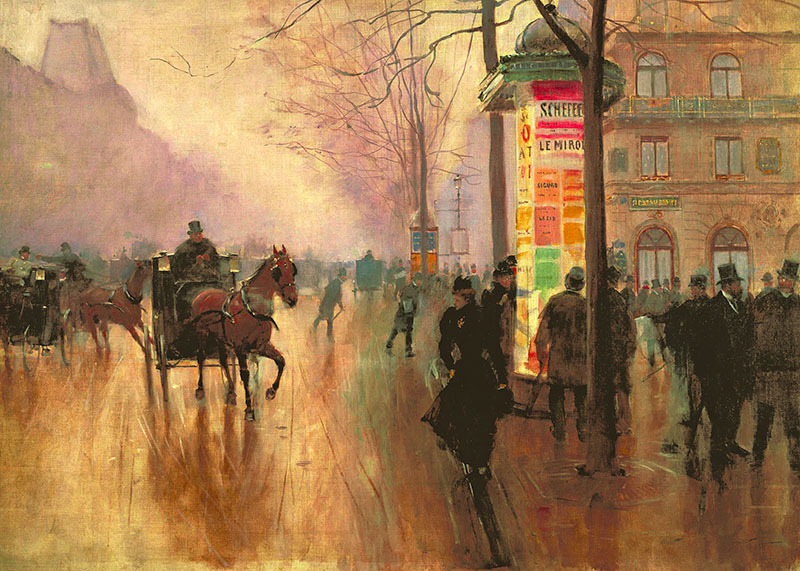 Carriages on the Boulevard des Italiens (1890) shows the same kiosk in the golden light of a winter’s afternoon. Jean Béraud (1849–1935), Mary Magdalene in the House of Simon the Pharisee (1891), oil on canvas, 104 x 131 cm, Musée d’Orsay, Paris. Wikimedia Commons. Béraud also painted in other genres, although images of those works are much harder to come by. 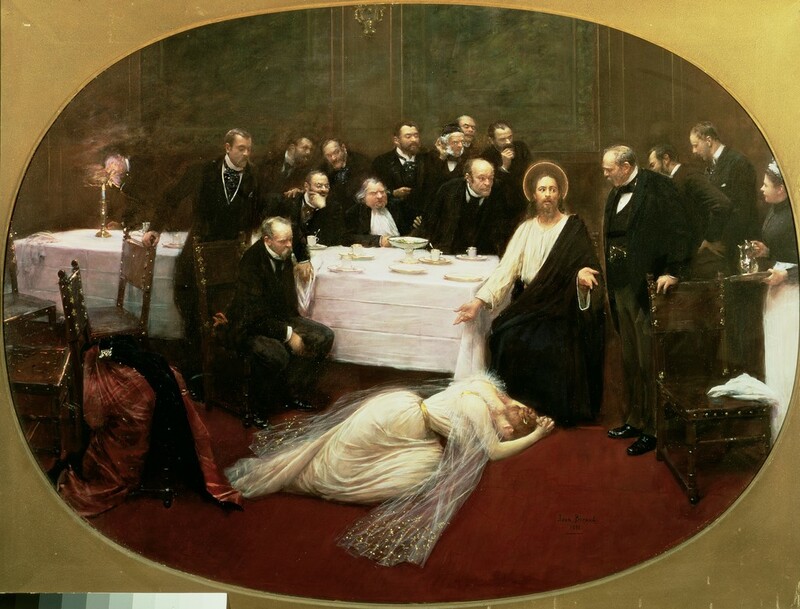 Mary Magdalene in the House of Simon the Pharisee (1891) was one of his more extraordinary paintings, which was highly controversial at the time. The painting (and its title) refers to a story from the ministry of Jesus Christ, in which Jesus was invited to dine with a Pharisee. A woman who had lived a sinful life – usually assumed to have been Mary Magdalene – came, wet Jesus’ feet with her tears, and dried them with her hair before anointing them with perfume. Christ and Mary Magdalene have been transplanted into a dinner attended instead by many prominent figures in the arts of the day. These have been identified as Antoine Duc-Quercy (1856-1934), Liane de Pougy, née Anne-Marie Chassaigne, wife of Henri Pourpre then of Prince Georges Ghika (1869-1950), Ernest Renan (1823-1892), Hippolyte Taine (1828-1893), Jean-Jacques Weiss (1827-1891), John Lemoinne (1815-1892), Edmond Taigny, Eugène Chevreul (1786-1889), Alexandre Dumas the younger (1824-1895), Dr Adrien Proust (1834-1903), and Jean Béraud himself. Jean Béraud (1849–1935), Symphony in Red and Gold (1895), other details not known. The Athenaeum. 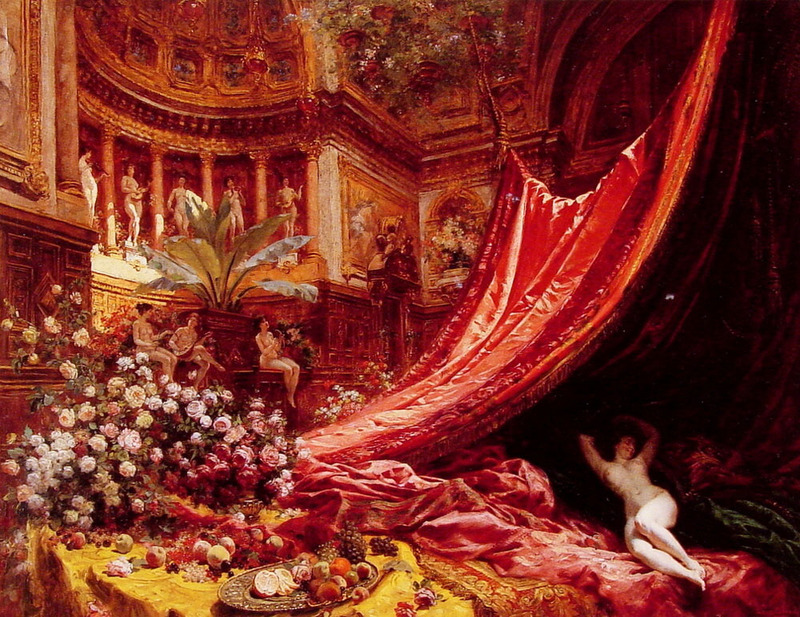 If there is one of his paintings which perhaps captures the extreme excess of this period in Paris, it is his Symphony in Red and Gold (1895), which perhaps fittingly marked the end of his most productive, mature period. 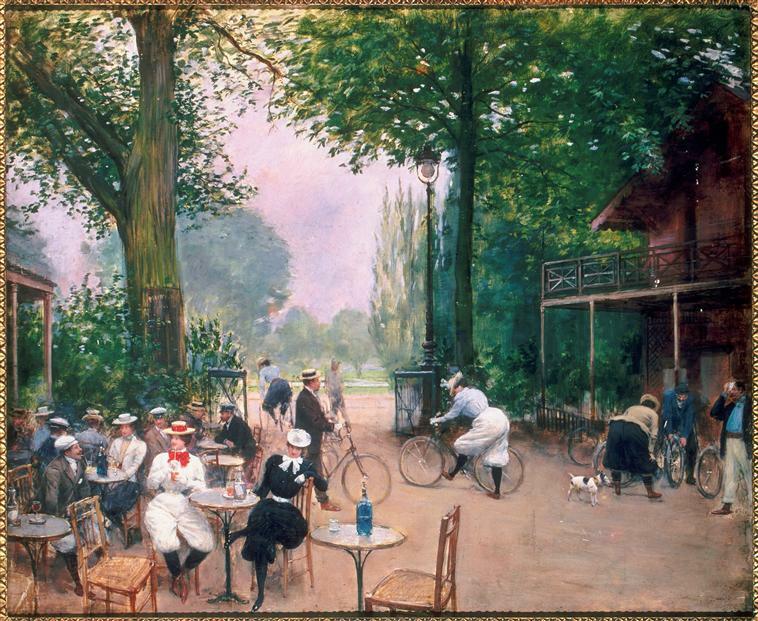 He also painted the Cycling Madness which swept France, and led to the establishment of the Tour de France, in his The Cycle Hut on the Bois de Boulogne (year not known). Jean Béraud (1849–1935), After the Service at the Church of Sainte-Trinité (the ‘American Cathedral’, Avenue George-V, Paris) (c 1900), oil on canvas, others details not known. Wikimedia Commons. 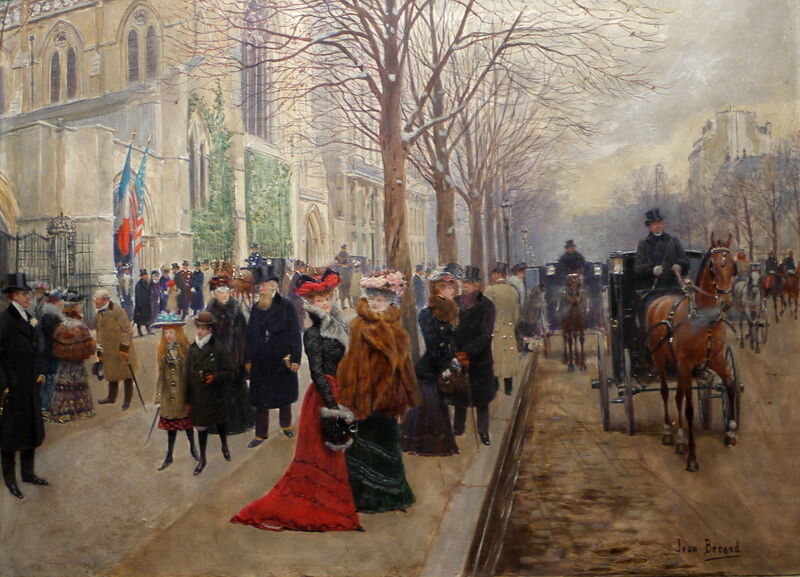 He continued to paint the streets of Paris, as in his After the Service at the Church of Sainte-Trinité (the ‘American Cathedral’) (c 1900), which shows Avenue George-V and affluent Franco-American society. Jean Béraud (1849–1935), Workers leaving the Maison Paquin (1907), further details not known. The Athenaeum. Workers leaving the Maison Paquin (1907) shows the ladies who worked in Jeanne Paquin’s highly successful fashion house in the Rue de la Paix, as they left work at the end of the day. 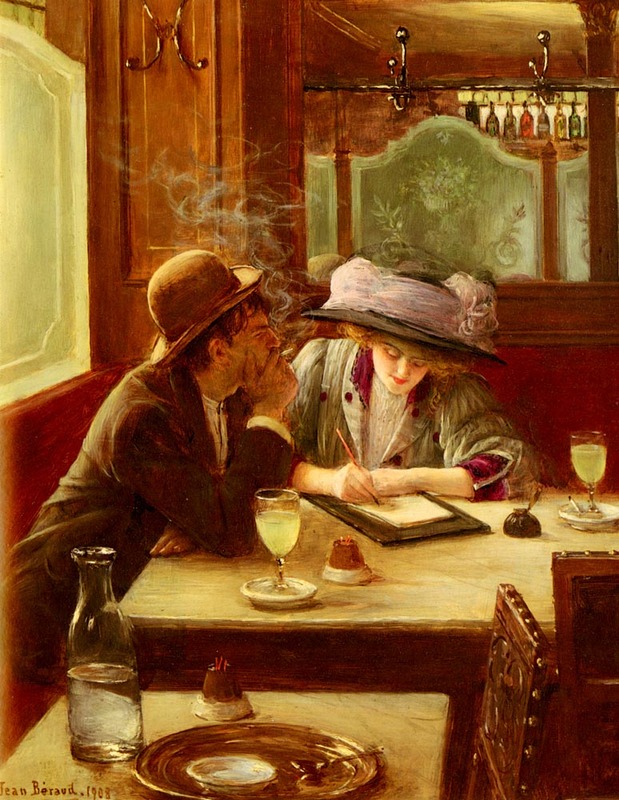 Jean Béraud (1849–1935), The Letter (1908), oil on canvas, 45.7 × 37.2 cm, Private collection. Wikimedia Commons. The Letter (1908) offers a glimpse into the café culture of the years prior to the First World War. The man looks rough, and is unshaven, although the woman is elegantly dressed, and apparently engaged in writing a letter. In front of each of them is a glass of absinthe, notorious for the severe forms of alcoholism with which it was associated. 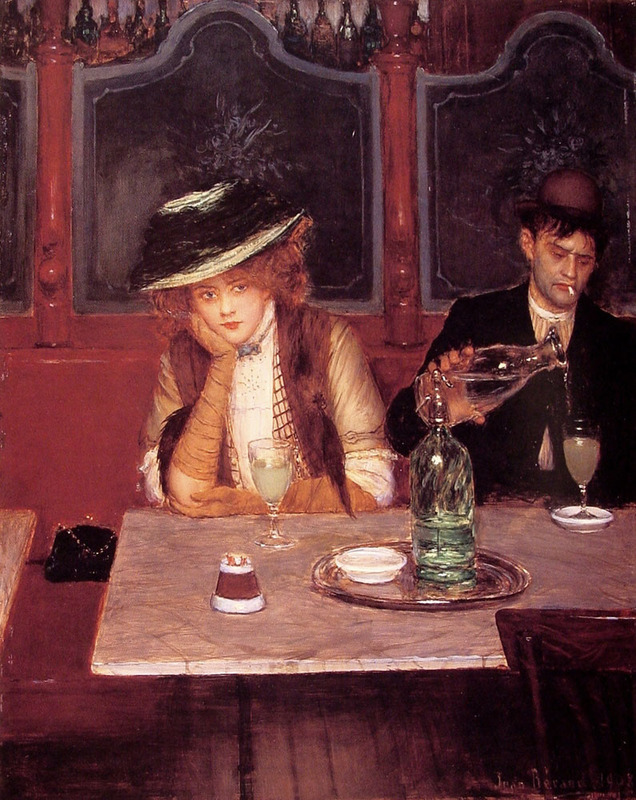 The Absinthe Drinkers (1908) shows a similar scene, with the man adding water to his glass, which turns the pale yellow absinthe cloudy. The woman this time stares vacantly at the viewer. 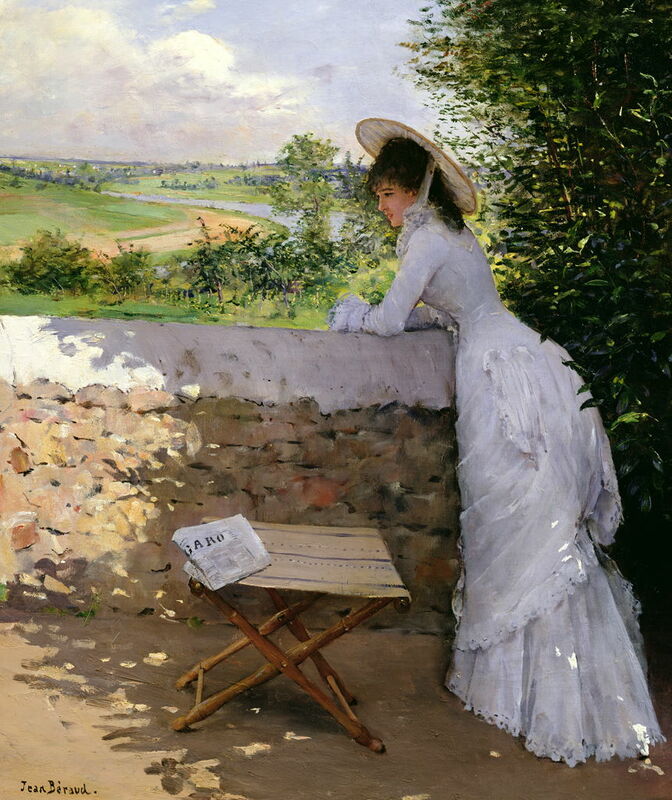 Béraud was a popular if not acclaimed painter of the period, but because he was not part of the Impressionist movement, he has been almost completely ignored by art historians. A few of his paintings have entered major public collections, but are seldom seen. Yet – aside from their clear artistic value – they give us great insight into life in Paris over a period of more than thirty years. 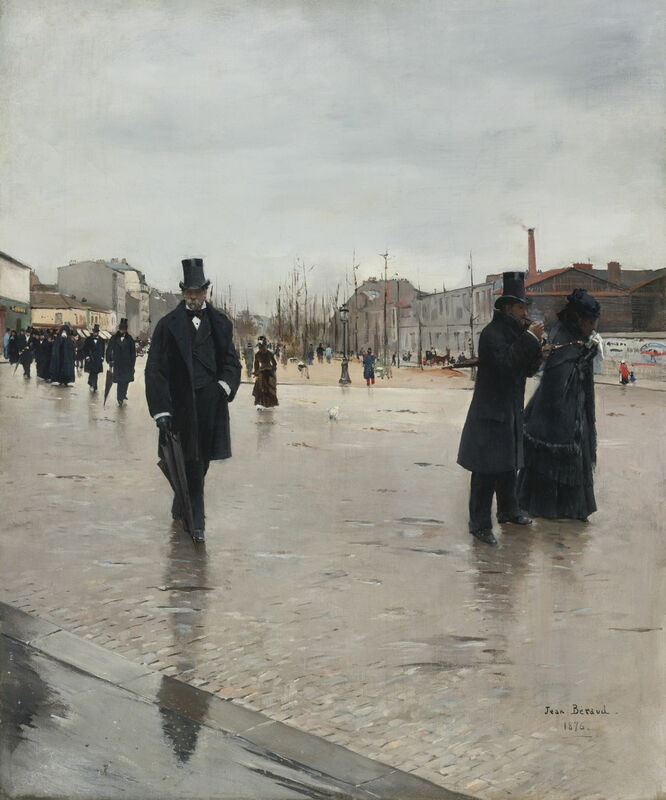 Posted in General, Painting and tagged Béraud, Caillebotte, Impressionism, painting, Paris. Bookmark the permalink.